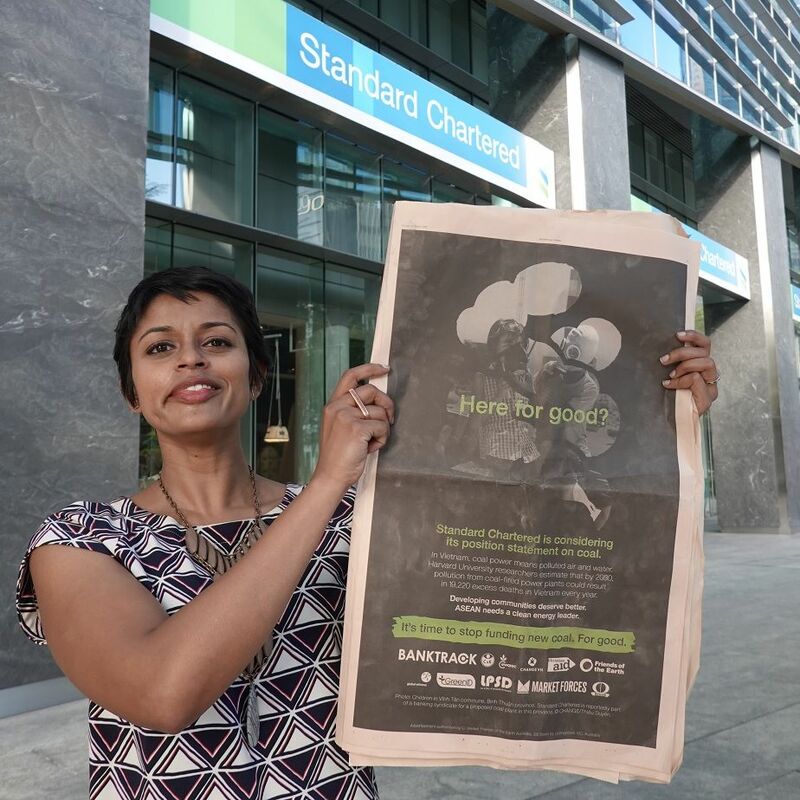 350.org East Asia – Victory: Standard Chartered to Stop Financing New Coal Power Plants! Standard Chartered bank updated its policy on lending to power generation, ruling out new coal power plants anywhere in the world. It confirmed the bank would no longer directly finance "any new coal-fired power plant projects, including expansions, in any location". Standard Chartered bank updated its policy on lending to power generation, ruling out new coal power plants anywhere in the world. It confirmed the bank would no longer directly finance “any new coal-fired power plant projects, including expansions, in any location”. This marks a massive shift for a bank that, since 2010, had loaned US$1.8 billion to coal power, including $820 million to projects that added 10,600 Megawatts of new coal power capacity around the world. Even as the policy was being prepared, Standard Chartered were in line to finance three new coal power plants in Vietnam that would have produced another 700 million tonnes per year of CO2 emissions. Those projects have now lost a critical source of finance. Although headquartered in the UK, Standard Chartered is a global bank and effectively based in Singapore. It is dominant in Southeast Asia, where over 100 Gigawatts of new coal power plants are proposed. Not a single one of them could be considered compatible with holding global warming below 2ºC. People and organisations from around the world had called on Standard Chartered to rule out new coal power plants in their policy update. Over an intense few months of campaigning, which involved tens of thousands of people writing to the bank, messages came in from almost every part of the world. Market Forces coordinated with global NGOs and groups in Vietnam to publish a full-page ad in the Asian Financial Times, insisting the bank’s policy update rules out new coal completely and removes them from the three Vietnamese power stations they were in line to finance. It looks like the wishes of those people, especially our friends in Vietnam, have been met! Throughout 2018, seven other banks active in Southeast Asian coal power lending have announced changes to their policies. However, the trend has been towards thresholds and loopholes that keep the door open to new coal power plants, depending on where they are or the technology used. Singapore’s banks have all said they will not finance the “dirtiest” coal power plants, taken to mean ‘subcritical’, but have clearly kept the door open to other technology types, which are still heavily greenhouse gas intensive. Japan’s banks all updated their positions this year and, while the language they each used was different, they coalesced around not lending to anything worse than ‘ultrasupercritical’ technology, or that which emits no more than 750 grams of CO2 per kWh. This should mean they would have to withdraw from approximately 30% of the projects they were in line to finance, but still leaves many projects open to receive finance. HSBC came out with the most blatant exceptions, ruling out coal power except in Indonesia, Vietnam and Bangladesh, three countries where there are some of the biggest pipelines for new coal power (and presumably, three countries where HSBC has a fair bit of coal business lined up).